During a visit to Wellington by John Howard in 2003, two antiwar protesters – teacher Paul Hopkinson and Overland’s own Dougal McNeill – burned a New Zealand and an Australian flag in protest. The case ended up in court as it was a crime at the time to destroy or damage the New Zealand flag ‘with the intention of dishonouring it’, and Hopkinson was sentenced to pay a fine of more than $700. The conviction was overturned a year later in the High Court, leading subsequent flag-burners to being charged with disorderly conduct instead of the more contentious crime of desecration. But what was most ironic and amusing about the original proceedings is that when the police officer who witnessed the event was asked to describe the New Zealand flag at the trial, he described the Australian flag instead. This is the lot of the current New Zealand flag: that of a colonial relic likely to be mistaken for that of our neighbours even by the people ostensibly in charge of defending its honour. So you can see why in both countries there would be a permanent movement of people who favour changing the flag. You could also anticipate a prime minister being willing to put it to a vote without tackling bigger questions such as the form of our respective governments. And so it happened that earlier this year John Key proposed two binding-referenda: one to choose a new flag design, the other to decide if it should replace the one we already have. The process so far has been predictably dreary. I am no fan of nationalism, but for a country to have this kind of debate in peacetime and in the absence of a constitutional revolution or crisis, is to deprive it of all moral and political urgency. There has been no attendant reflection on who we are, because at this time New Zealand largely views itself as a small country after the end of history: at peace with its Indigenous people, unburdened by compelling alternative political visions, anxious about its future yet unwilling to show it. This is the nation that politicians of various stripes sometimes refer to with utter lack of irony as ‘New Zealand Inc.’ Accordingly – and in spite of the rhetoric implicit in the name of the ‘What we stand for’ campaign – the flag change project has been conducted from the start as a corporate rebranding. Witness the composition of the panel consideration flag, which includes the owner of a successful accounting software firm, the CEO of the local division of Saatchi & Saatchi, a former coach of the All Blacks (of course), a reality television producer (eh? 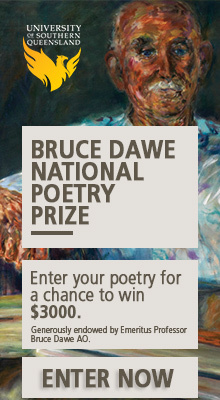 ), the grand total of one Maori academic and no artists or designers. 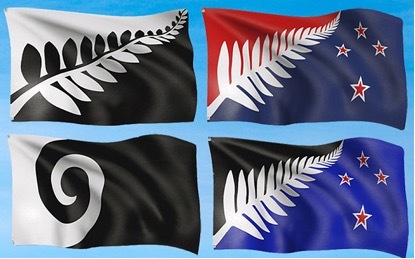 Prime Minister John Key repeatedly expressed his preference for a flag featuring a silver fern, and hey presto, three of the four flags on the shortlist have got silver ferns on them, including two that were touted by Key’s pollster over a year ago. So much for the lengthy, expensive consultation process and the ten thousand submissions. The referendum will be based on the single transferable vote system, so it seems virtually guaranteed that the lone koru design (aka the hypnoflag) will be rejected, while either of the two near-identical designs by Kyle Lockwood stands the best chance. Where it goes from there, remains to be seen: it could be that the citizens simply say no, thank you, our current flag may be mediocre and virtually indistinguishable from Australia’s, but it’s got some history still attached to it – for better or worse – and at any rate it’s preferable to flying a beach towel; or John Key will get his wish and a new logo that ‘could be worth billions’ in brand recognition for the nation’s exports. This is our new, pallid patriotism, willing to trade the national symbol for a little commercial edge. But perhaps the best chapter of the story so far came when the flag consideration panel approached the All Blacks to enquire after the use of their silver fern design, and was rebuffed. This was Key’s barely concealed dream: to fly the universally recognised flag of the rugby team as the nation’s own, a sentiment echoed by captain Richie McCaw ahead of the team leaving for England to defend the World Cup. But the Rugby Union wouldn’t have it: there is too much commercial value in that heavily trademarked and protected symbol – so powerful that disgraced American insurance giant AIG chose it when it came time to launder its image – for them to be willing to share it. Even as the ceremony for the last team announcement was hosted at parliament, the All Blacks still refuse to go the final step: for their flag is more precious than ours. I hear that the Hundeertwassr trust wil not give permission to use the koru design. It’s more complicated than that: they blocked the knock-off that was included in the long list, on the ground (I presume) that it was missing the black bar which was an integral part of the design. Hundertwasser always intended his flag to be an alternative one, which may explain why they didn’t submit it. Along the same lines, the Tino Rangatiratanga flag is *already* an official New Zealand flag and was hence excluded from consideration. I did not realize that about the Hundertwasser flag. I like in even more now that I know it’s reserved for dissident use. This, in my opinion, is exactly the reason Key is having this ‘Flag Deliberation’ now. It is effectively his (National’s?) strategic, cultural-political pre-emptive strike. Separate the symbol from its deeper meaning without (before) any possibility of Kiwi’s deciding that deeper meaning together co-operatively in a Constitutional consideration process; and perhaps enshrining such meaning which sensibly attaches to the symbol?